The Naked Mole-Rat (Heteroephalus glaber) also known as the Sand Puppy, is a rodent that typically burrows. Despite the name, they are neither moles, or rats. They are more closely related to porcupines and guinea pigs. They are found in parts of Eastern Africa and has a rather unusual set of physical characteristics that give it the ability to thrive in a harsh underground environment. It is almost completely cold blooded, has no pain sensitivity in its skin, has a very low metabolism, as well as low respiration. And they are of course, ‘naked’, with very little hair. Naked mole-rats are generally quite small in size. The male mole-rat is between 3 and 4-inches long and will weigh between 1.1 and 1.2-ounces. The females (called queens) are larger and can weigh as much as 1.8-ounces with the largest recorded at approx. 2.8-ounces. The eyes of the naked mole-rat are very small, and this contributes to their poor vision – but they are not blind as is often assumed, and can burrow with eyes closed. They have thin and short legs, but easily move underground. They are expert burrowers and amazingly can travel as fast backwards as they can forwards. They have large protruding front teeth like a miniature walrus that are used to dig with their lips sealed just behind the teeth, which prevent dirt and debris from entering their mouths. Naked Mole-Rats eat the underground parts of plants, which means their diet mainly consists of roots or tuber – leaving enough behind for it to survive so they can feed on it again for another meal. They have very little in the way of hair. This is why they are called ‘naked’ and their skin is a wrinkled pink or yellowish color. They do not have an insulating layer under their skin. 1. The Naked Mole-Rat can live in a zero oxygen atmosphere. Research has revealed that this burrowing rodent can live up to five hours in a setting that has just 5-percent oxygen. It can also live in an atmosphere of 80-percent CO2. In a zero oxygen environment, the Naked Mole-Rat can live for up to 18-minutes without suffering any harm. 2. The two lower front incisors of a Naked Mole-Rat can be moved independently & voluntarily of each other. Photo credit courtesy of Smithsonian’s National Zoo & Conservation Biology Institute. 3. 25% of the Naked Mole-Rats muscle mass is in its jaw. This is the same percentage humans have in each leg to put it in perspective. This is because their jaws are designed for digging. 4. The Naked-Mole Rat feels no pain. 5. Naked Mole-Rats have a cancer resistance. 6. They are unable to thermoregulate their temperature. With burrow air remaining around 30 degrees C year round, naked mole-rats have very little need to control their body temperature. 7. 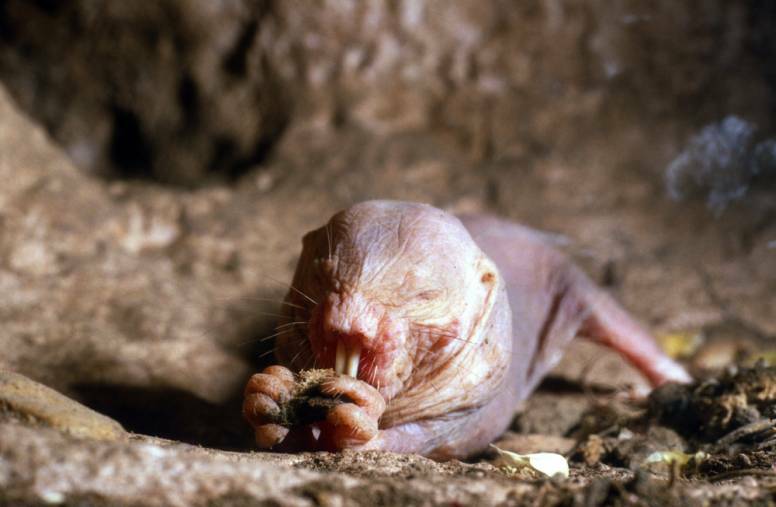 Naked Mole-Rats spend all their life underground. They live virtually all their life in complete darkness underground. 8. The Naked Mole-Rate has adapted to its living conditions. As the tunnels of the naked mole-rat habitat will have low oxygen levels, the creature has adapted to this and can live quite comfortably in the harsh conditions. They have underdeveloped lungs and the blood of the naked mole-rat has a high affinity for oxygen which results in a more efficient uptake of it. Due to long periods of hunger experienced by this underground rodent, it has adapted to have a low respiratory and metabolic rate for an animal of its size. The metabolism of the Naked Mole-Rat can be reduced by as much as 25-percent when necessary without causing any hardship to the rodent. 9. The Naked Mole-Rat is the longest living rodent, by some distance. The adaptations that have happened over time that have allowed the mole-rat to live in such a harsh setting have added years to its life. Other rats of a similar size live up to 2 years, while the Naked Mole-Rat can live for as long as 32 years. How naked mole-rats survive so long is a mystery to scientists. 10. They are one of only two mammal species that are eusocial (meaning individuals living in a social hierarchy, with specific roles & systems). 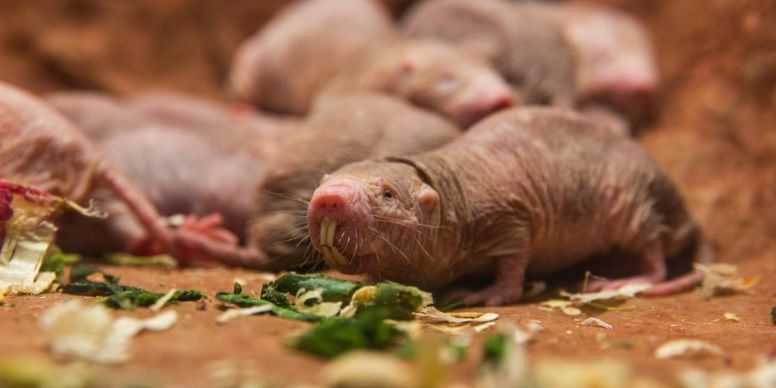 A cluster of Naked Mole-Rats makes up a single community with each having specific roles. Clusters have an average of 75 to 80 mole-rats (but can be as high as 300 animals) who all live together in a complex array of burrows underground. The mole-rats have a community structure that includes queens, breeding males and workers. It is comparable to that of ants, bees, termites and wasps. 11. The tunnels they construct can travel as far as three to five kilometers (3 Miles!). Large colonies burrow complex underground tunnel systems that connect different chambers, which are for different activities. There are chambers for nesting, eating, and even a toilet! 12. A mole-rat colony can occupy the area of 20 football fields in size. This wide coverage allows them to have enough room for all the colony, as well as enough roots to snack upon. 13. The queen and her mates form long lasting relationships. A colony has a single female queen with no more than three male breeders. The breeding males and a queen can form a partnership that can last for many years, while other females are sterile. The average lifespan for a queen is between 13 and 18 years and the actual queen of a cluster can act very hostile towards another female that acts like a queen. When a queen dies, another female will fill the role but it isn’t an automatic passing down of a title. Sometimes the competition is so fierce that violent struggles can ensue until a victor is clearly decided. 14. 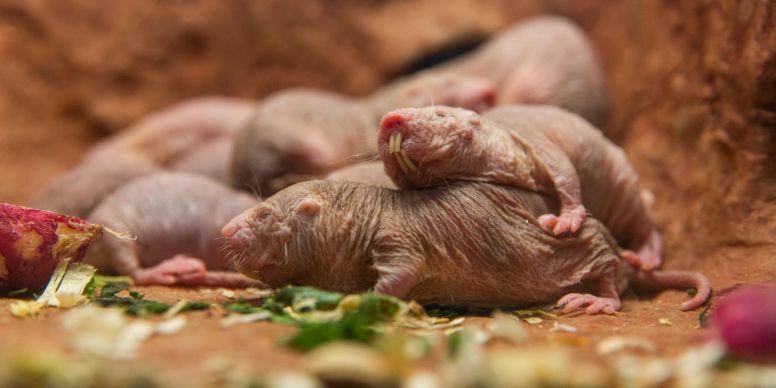 The Naked Mole-Rat reproductive cycle is short. Gestation can last roughly 70 days and a litter can number three to twelve pups and it is not uncommon to see large litters of up to 28 pups. The average litter is just under a dozen and breeding is once a year in the wild, provided the litter survives. In captivity, Naked Mole-Rats breed all year and can produce litters every 80 days. The pups are born blind and weigh not much more than 2 grams. They are nursed for the first month of their lives and then another member of the colony takes over for the queen to keep the pups fed. 15. A worker does just that – works all the time. The smaller worker mole-rats are the busiest ones in the colony. Their primary role is to locate food and to keep the complex tunnel system maintained. The larger workers are constantly on the lookout as they are the ones who defend the colony in case of attack. The workers are clearly split into two different groups with the tunnelers working to always expand the network of burrows and spend all their waking hours on that task while others are the soldiers who are responsible for providing ongoing protection from outside predators. Of the workers there are two classifications – the frequent worker and the infrequent worker. As the names suggest, one is a harder worker than the other and in some cases the roles can overlap. The infrequent worker tends to complete tasks at a slower rate than the frequent worker can. The common predators are snakes and raptors. 16. Naked Mole-Rats communicate with over 17 different vocal sounds. They communicate with each other using grunts, chirps, squeaks, trills, hisses – more than any other known rodent. 17. They have adopted an odd and rather grim habit – rolling in feces and urine of their underground toilet chamber. 18. They survive without drinking water. Instead, they extract liquid from the plants they eat. In the dry, desert underground environment, they randomly dig to find roots and tubers to eat, and extract water solely from plants they consume. “Fructose-driven glycolysis supports anoxia resistance in the naked mole-rat” (2017), via Science Mag. “Incisors for hands: naked mole rat mechanosensation”, via Sensory Evolution blog. “Hypofunctional TrkA Accounts for the Absence of Pain Sensitization in the African Naked Mole-Rat” (2016), via Cell Reports. “Naked mole rat’s secret to staying cancer free” (2013), via Science Daily. “Cornell biologist Paul Sherman writes children’s books about mysterious mammal”, via Cornell Chronicle.